Don’t forget to wear red on Friday, February 4th to promote awareness for heart disease. Heart disease is the number 1 killer for women and many don’t even know they have it. This is important to me because my grandmother had heart disease and I have several risk factors for the disease, including a scare last year that sent me to a cardiologist for 2 stress tests. 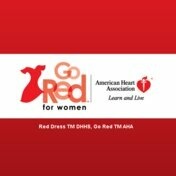 Visit the website for Go Red for Women by using this link. Well, I’m glad to hear we may be in for an early spring from the results of Groundhog Day. I certainly hope so! We had warm weather in TN last weekend in the high 60’s and now its back in the 20’s today! I really miss the warm weather and sunshine! I’m so proud of my daughter, Whitney. She gets up every morning at 6:00 a.m. and works out on the treadmill. I have trouble working out in the mornings – I’m not really a morning person and prefer to work out after work. She is making great strides in her weight loss. I think the best thing she has done is give up sugary drinks and exercise more. She is my inspiration! Go Whitney, Go! Did you watch the Biggest Loser last night? I loved it when the Purple team almost brought Jillian to tears. Very touching….and brought me to tears also! I am really confused why the black team came on the show. Since neither of them really wanted to be there at all anyway. Someone that wanted to do the program could have taken their place. I’m not sure that I agree with the decision of which one of the Red team to send home. But the “family” made that decision. It’s February! It’s hard to believe January is over but now a new month begins. I jumped on the scale this morning and am not sure if my eyes were deceiving me…but it looked like I had lost 5 lbs. This is such a surprise since the scale has not budged in my favor for some time now. I guess being sick last week had some to do with that. Happy about it, though! I hope your Tuesday is terrific!